21.1 km, “28 years of success” according to the website, 2500 registered runners, arrival at 2800m and a breathtaking view all along: that’s the Aletsch half-marathon. I’ve been training for this not because I wanted to finish in good time, but because I wanted to be able to take advantage of the view instead of just watching my shoes and coughing up my lungs. Day – 7: Doug sends me a picture of the Col du Grand St Bernard (2500m) with abot 2m of snow. The weekend before the race, I’m hiking in Chamonix at less than 2000m altitude, and there is snow all around me. According to the website, the organizers are hoping that the hot weather will melt the snow so that the original route can be maintained, but I’m not very confident. Day – 2: Incredible news! Thanks to the hot weather and the great efforts made by the organizers to clear out the snow, they’re keeping the original route! Day-1: I Arrive in Bettmeralp where the half-marathon starts, and it is snowing… I take the lift to see what the arrival is like and I discover a white landscape. It looks as though they literally dug through the snow to clear the trails, but fresh snow is covering everything yet again. Bad news: I can’t see any sign of the race coming through here except for a single flag. Bad news: I can’t see any sign of the race coming through here except for a single flag. As I head back down, I see volunteers bringing down the barriers and setting up for the arrival at the bottom of the lift. When I get my bib number, I’m told that the race has been shortened because of the weather and for security purposes: they’re worried that the fresh snow will turn into ice overnight. Instead of 21K/1000m+, it is going to be 15K/300m+. I’m also told that we will only be racing the first flat 10K of the original race and coming back directly to the starting point, which means that we won’t be running along the ridge and, unfortunately, won’t have the chance to see the glacier through the larches. D Day: 20 minutes after the kids have finished their race (called the “fox run”, with very tiny but brave children), our race starts very fast, at least for me as I’m normally used to running longer distances. It starts in the woods around Bettmeralp on a dirt road, allowing everyone to spread out, then starts to climb and changes into a clean singletrack that leads us from the forest to the meadows of Bettmeralp. As I run along Bettmersee (which means “the lake of Bettmer”) I hear people shouting “Hop hop hop!”, “Bravo!” and “Allez allez allez!” – Switzerland’s language diversity at its best! The race continues on a traverse towards Riederalp, where we can see the snow-covered peaks of the Valais. From Riederalp, the last short uphill leads to the last downhill, still on a nice trail with one single technical difficulty announced loudly by the organizers: “Mind your step!!!”. We arrive in Bettmeralp where the last kilometer takes us through the streets of the village with many spectators still cheering us on. I finish the race with the feeling of having missed something. We arrive in Bettmeralp where the last kilometer takes us through the village with many spectators still cheering us on. Organization “au top” (two thumbs up! ), nice trails, and pretty views, but I expected a mountain race with difficulties, one long ascent, rocks and maybe snow, altitude, and of course an astonishing view on the glacier. Next year I’ll be back! Luckily, the organization offered us a return ticket to Bettmerhorn via the ski lift, where I was finally able to admire the splendid glacier. 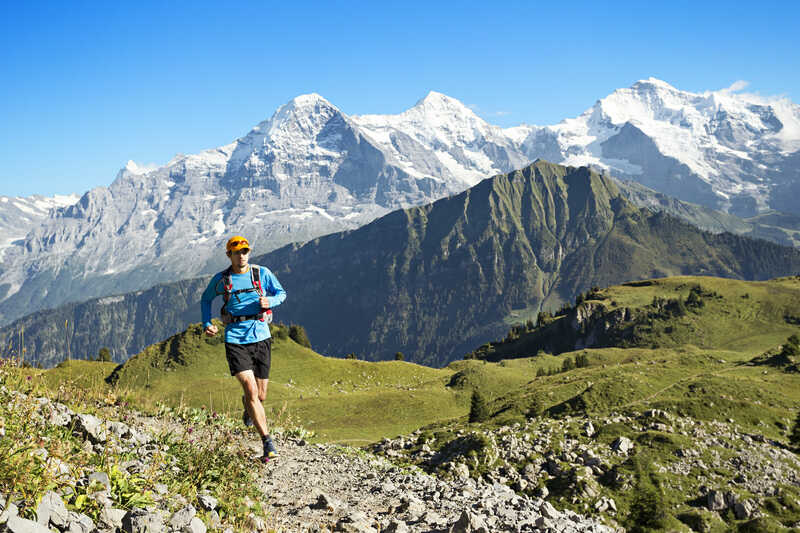 I talked with a runner who had arrived in Bettmeralp 20 minutes before the race and only realized that the race had been shortened when he crossed the finish line! I was finally able to admire the splendid glacier.